Technical analysis based trading is the belief that the price of an asset in the short term depends on market psychology which gets reflected as market trends. A technical trader aims to identify trading opportunities by analysing price & volume movements, however, it is not a simple as it seems. TA based trading requires the trader to build and follow a system in a disciplined, patient way. In this article, we shall discuss how market cycles work as a step one to building a robust trading system. No matter what market you are referring to, all go through the same phases and are cyclical. They go up, peak, go down and then hit bottom. When one market cycle is finished, the next begins. The problem is that most investors and traders either fail to recognize that markets are cyclical or forget to expect the end of the current market phase. 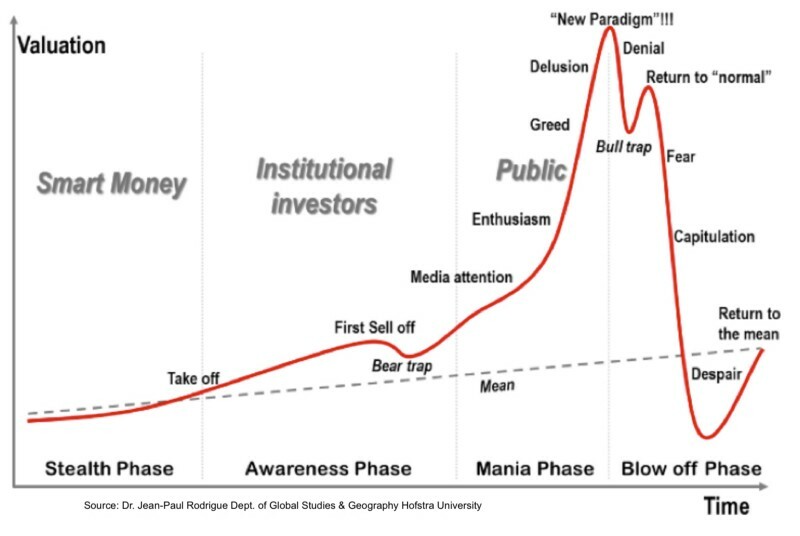 This phase occurs after the market has bottomed and early adopters begin to buy, figuring the worst is over. At this phase, valuations are very attractive, and general market sentiment is still bearish. Overall market sentiment begins to switch from negative to neutral. The end of an accumulation phase is typically marked by a breakout where trade sentiment moves towards neutral and traders start sniffing an opportunity. The market has been stable for a while and is beginning to move higher. The early majority are getting on the bandwagon. Traders, seeing the market is putting in higher lows and higher highs, recognize market direction and sentiment have changed. Markup phase begins with a breakout and tends to continue till there is a major pullback. Markets start trending upwards and more investors jump on the bandwagon as greed and the fear of losing out take over. This part of the cycle is identified by a period in which the bullish sentiment of the previous phase turns into a mixed sentiment. Prices can often stay locked in a trading range that can last a few weeks or even months. The distribution phase is a very emotional time for the markets, as investors are gripped by periods of complete fear interspersed with hope and even greed as the market may at times appear to be taking off again. This phase is marred with consolidations, breakouts and pullbacks at small scales, identifying trends become difficult. The fourth and final phase in the cycle is the most painful for those who still hold positions. Many hang on because their investment has fallen below what they paid for it refusing to let go in the vain hope of being rescued. Timing the market correctly is the first step to making profits with TA. You would want to build a system that helps identify an entry point when the market is in the ‘mark up’ phase. The system should then also help you also identify when to exit once the asset is moving from the distribution to the ‘mark down’ phase. ← How Mudrex executes a strategy?